Comments: An impressive and reasonable complex Highlander. The fruity notes of the madeira cask are dominating the nose. On the palate, however, the American oak overpowers the fruitiness with vanilla, pepper and warming oak spice. Not unbalanced though. A pleasant transformation from fruitiness to spiciness and dry cocoa on the finish. Very enjoyable both neat and diluted. Nose: The nose starts off with lots of fruit, gooseberry, red currant and tangerine. Sweet and slightly sour at the same time with a touch of citrus and a whiff of pineapple. With time, there's a hint of youngish marc-like flavours coming through. A very pleasant nose indeed. Palate: Deliciously creamy, even viscid on the palate with lingering fruit, tangerine, gooseberry and a touch of bitter orange peel. This is complemented by delicate spice with oak and white pepper, leading to a warm finish. Finish: The finish is medium-long with pleasant stewed fruit and sticky honey on the tongue, covered by lingering warm oak spice. With water: There's even more fruit, almost a potpourri on the nose with lots of gooseberry, tangerine and mirabelle. Becomes sweeter and more fruity on the palate with less spiciness. 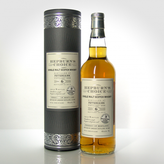 The finish is medium-long, sweet with lingering oak and gentle marzipan on the tail. Comments: An impressive fruit bomb. Not very complex after just 6 years (!) but the fruitiness clearly dominates here and fits quite nicely with the spiciness of the oak. The quarter cask finish has already diminished the juvenile character of the spirit leading to a savoury and delicate dram.